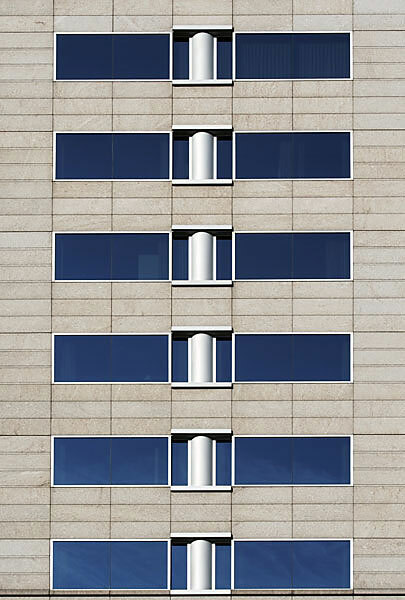 01 1201 THIRD AVENUE BUILDING | Kohn Pederson Fox (New York) & McKinley Architects 1988. 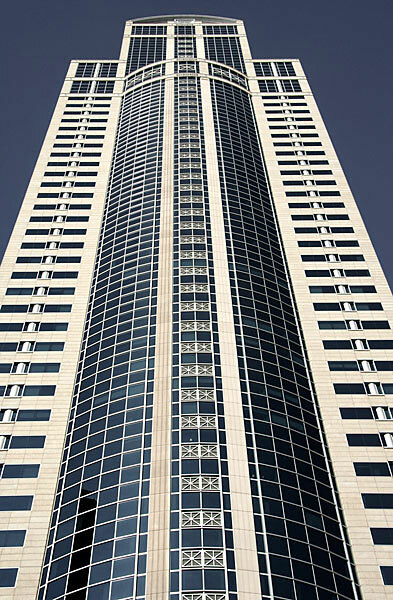 Formerly Washington Mutual Tower, this 55 storey post-modern building dominates the northern downtown streetscape. Behind four symmetrical facades its form is that of a glazed cylinder in a granite box. 02	1201 THIRD AVENUE BUILDING | Kohn Pederson Fox (New York) & McKinley Architects 1988. The strong blue sky of a late September evening sky intensifies and darkens the more cyan tints of the glazing. 03	1201 THIRD AVENUE BUILDING | Kohn Pederson Fox (New York) & McKinley Architects 1988. 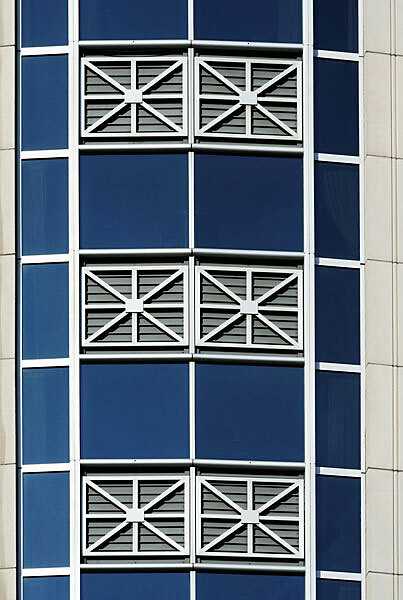 I was drawn to the symmetry and repetition of the design elements in the facades, particularly in the greater detailing of the central strip. 04	1201 THIRD AVENUE BUILDING | Kohn Pederson Fox (New York) & McKinley Architects 1988. 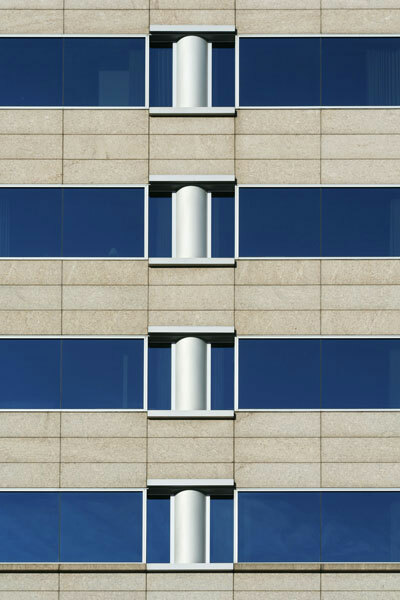 On the flat façade areas the intense late afternoon light enhanced the contrast between the blue glass and the pale colours of the granite cladding. 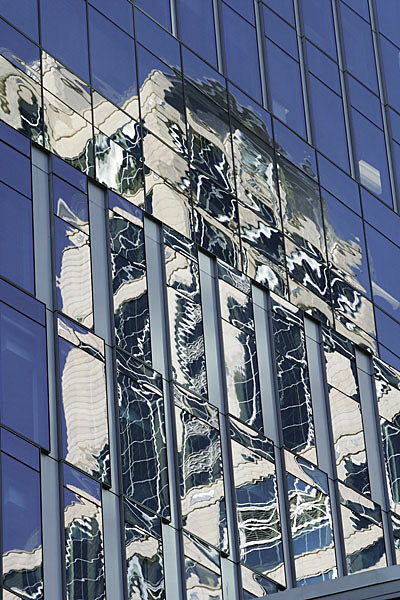 The façade of the Washington Mutual Bank's current home reflects its predecessor, formerly the Washington Mutual Tower, at 1201 Third Avenue. 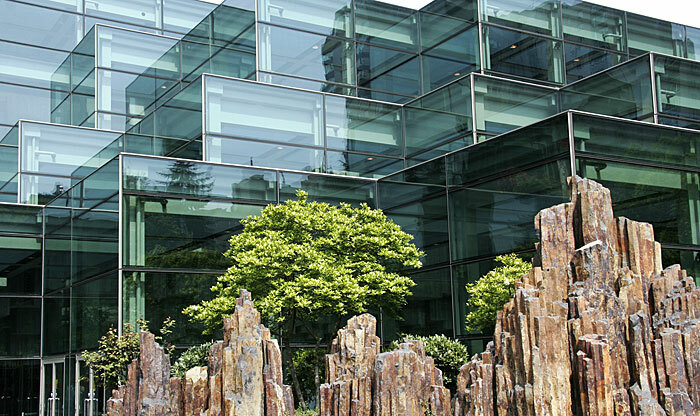 Viewed from the earlier Freeway Park, the Center's cubist green glass forms echo the architectural structures of the park and to which this run of garden sited volcanic rock in turn responds. 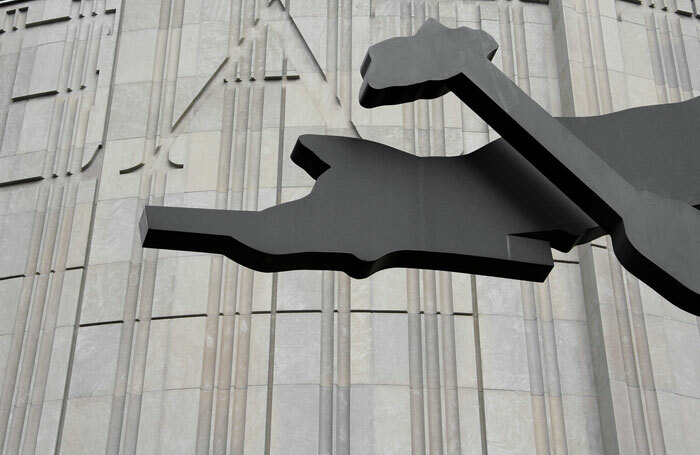 The hand and hammer of "Hammering Man" by Jonathan Borofsky stand against the curved and incised limestone of the First Avenue and University Street façade. Granite, sandstone, bluestone and brightly glazed terra cotta are combined at street level in counterpoint to the soft grey of the limestone above. 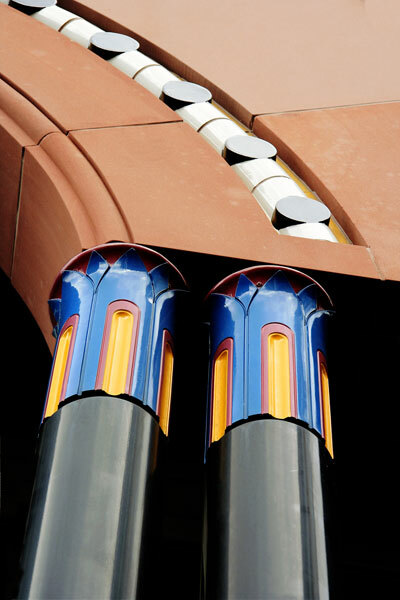 The strongly coloured glazed ceramic detailing echoes the material's use in the Smith Tower and elsewhere in Seattle, as well as Islamic, early European Gothic and other world architectures. 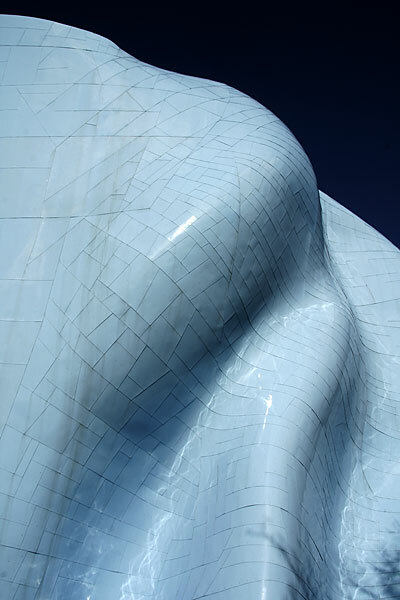 The undulating forms of the structure were designed using CATIA, a 3D computer modelling system developed by Dassault Systemes for aircraft design. Music in many manifestations, Jimi Hendrix sounds, and objects such as a shattered Fender Satratocaster influenced the whole concept. 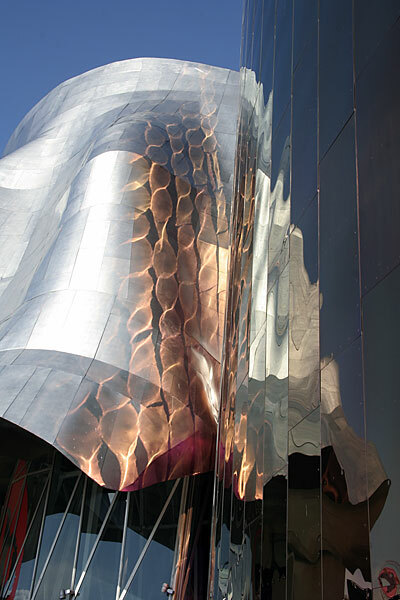 The building's skin is formed from several thousand individually cut and formed, polished and coloured, stainless steel panels. 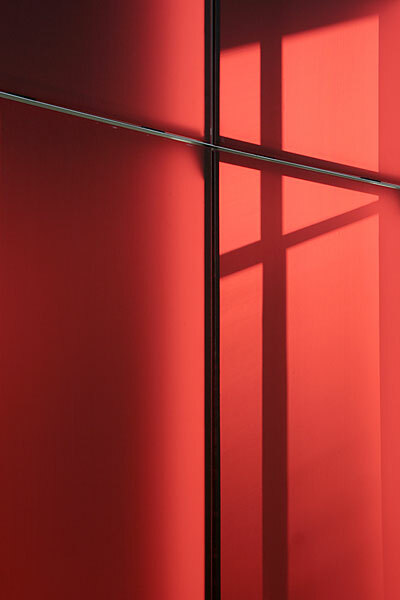 Light and colour are in constant flux. 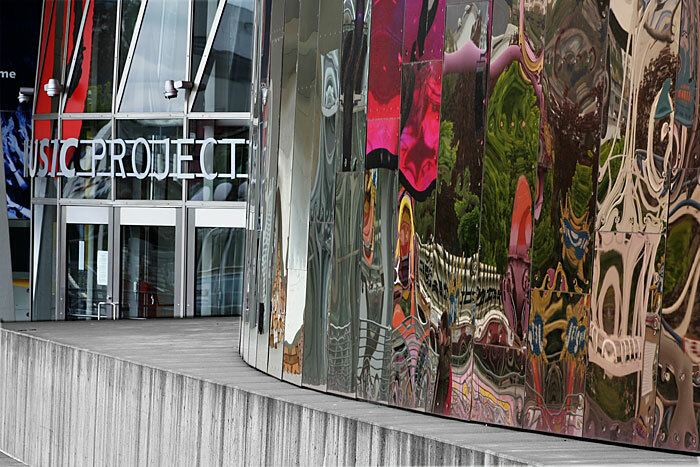 Red and blue stained panels and polished clear steel reflect one another above the main entrance. The constant change in colour effected by light and changing viewpoints was of prime interest. 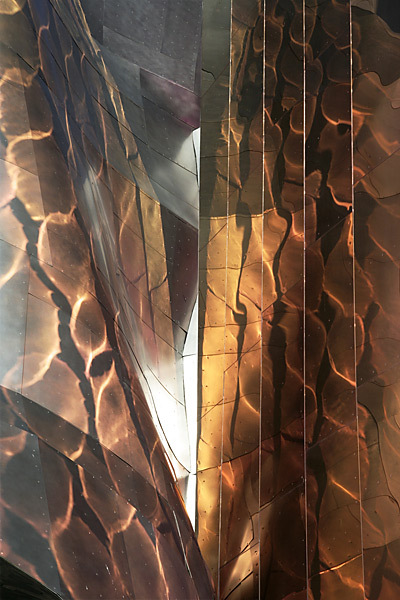 Light on opposed forms create counter reflections above the main entrance way. 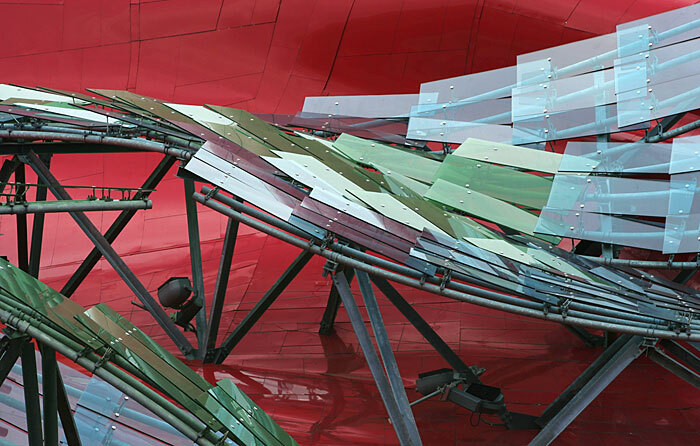 A curving facade in ever changing hues of red and blue reflects an adjacent form and fragments from the rides in the Seattle Center amusement park. 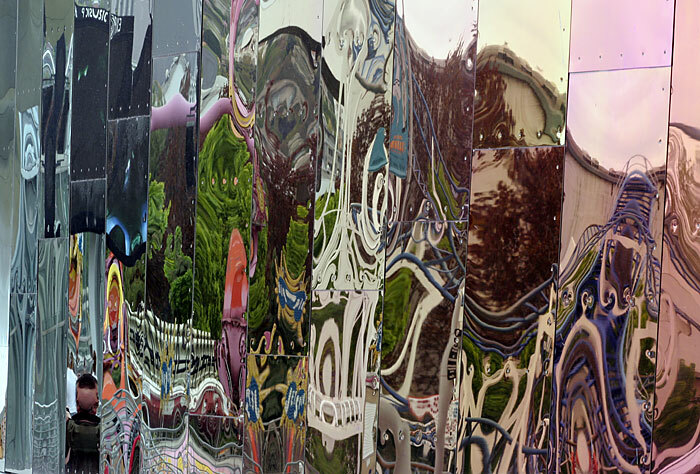 Here, the reds and blues on a tall curved façade register as almost clear and mirror the amusement park rides behind the camera. The hard-edged shuttered concrete is in marked contrast. 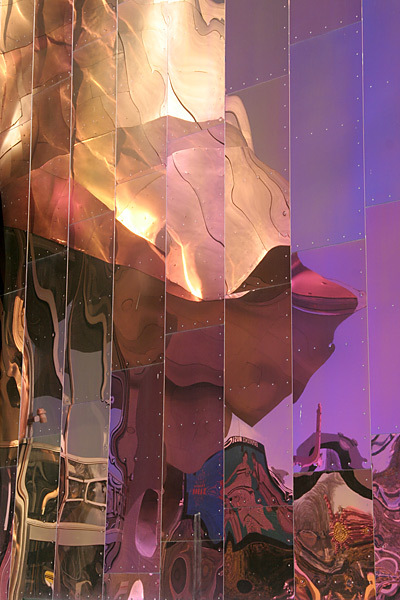 Here, the surface variations in the metal panels create baroque distortions of the surrounding buildings and the smaller structures in the amusement park. 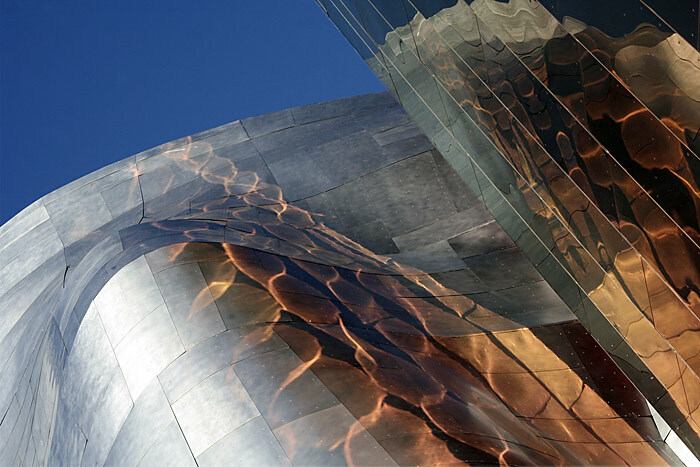 A steel substructure supports panels of glass shingles on the upper surfaces of the central eastern form of the building. 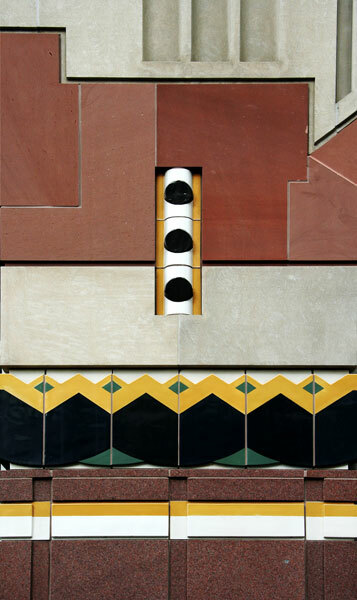 A detail from one of the arc of doors below the main entrance that open on to the fountain court overlooking Elliott Bay, combining indoor and outdoor space.